#stampinup #faithfulinkspirations I don't really "do" Easter cards. I do birthday (better late, than never), Christmas, and thank you cards. Maybe a retirement or graduation card, when needed. Oh, and sympathy cards. But I don't "do" the other holidays. Not Valentine's Day, St. Patrick's Day, Easter, Halloween (I always LOVE Stampin' Up's Halloween sets--but I don't have anyone to send Halloween cards to), or Thanksgiving. I don't know why. I just don't--don't judge me! 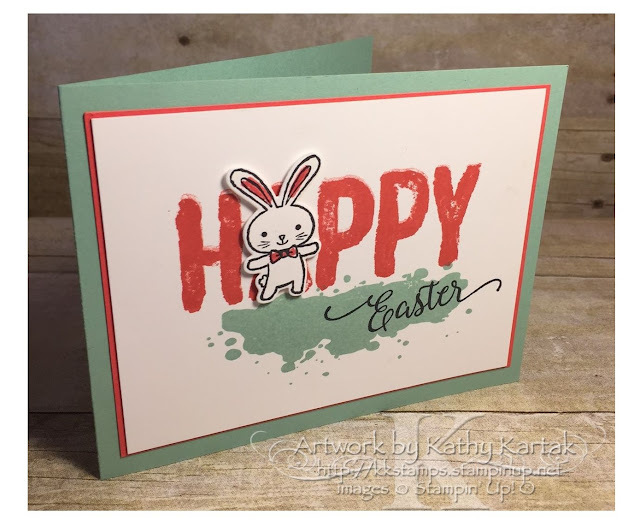 However, when I was in Texas and got to attend Lydia Fiedler's Saturday stamping class, one of her cards was this totes adorable Easter card! I wasn't going to turn that down, now was I? Here's the card Lydia designed, with just a tiny tweak from me. Lydia made a template for us by pre-cutting the bunny from the Basket Builder Framelits from a sheet of card stock and then aligned it in the MISTI Tool. She also pre-cut a fluffle of bunnies from Whisper White Card Stock. Using the MISTI Tool and the template, we could put our die-cut bunny into the template and then ink the bunny stamp from the "Basket Bunch" stamp set in Archival Black Ink and get the bunny stamped perfectly onto the pre-die-cut bunny! We colored in the bunny's ears and bow tie with a Watermelon Wonder Stampin' Write Marker. We stamped the word "happy" from the "Happy Celebrations" stamp set in Watermelon Wonder onto a 3-3/4" by 5" panel of Whisper White Card Stock and the "blob," also from "Happy Celebrations," in Mint Macaron Ink. Lydia performed some stamp surgery and cut apart the Easter stamp from the "Suite Sentiments" set so that just the word "Easter" remained. We stamped this onto the card in Archival Ink. We added the bunny to the card with Stampin' Dimensionals. I adhered the stamped panel to a 3-3/8" by 5-1/8" Watermelon Wonder mat and then onto a Mint Macaron Card Stock Card base, cut lengthwise and in the landscape orientation. So cute! I'm glad I got to play with these sets at Lydia's stamping class! !